Six-Time Chart-Topping Entertainer to Perform “Somebody Else Will” Show: TODAY Date: Monday, November 14 Time: 10:00am | All time zones Network: NBC | Check local listings PLATINUM-selling singer Justin Moore will debut his new single “Somebody Else Will” on TODAY Monday morning (11/14) at 10:00am on NBC (check local listings). The anticipated follow-up single arrives on the heels of his sixth No. 1 hit “You Look Like I Need a Drink,” from his fourth chart-topping album KINDA DON’T CARE (The Valory Music Co). Moore recently flexed his comedy muscles with an appearance on Jimmy Kimmel Live!’s CMA Awards post-show special. The talented entertainer introduced his wicked sense of humor to the late night audience as he performed “The Ballad of Claus Jorstad (Devil Stool)” about an unlucky man in Norway who had an unfortunate run-in with an Ikea stool in the shower. Watch it here. Moore will kick off his co-headlining AMERICAN MADE TOUR with Lee Brice at the beginning of 2017 with opening acts William Michael Morgan and Brett Young joining for the 25 dates already on the books. For tickets, tour dates and additional information visit JustinMooreMusic.com. New Single “Somebody Else Will” Climbing Radio Charts Show: Jimmy Kimmel Live! Date: Wednesday, November 2 Time: 11:35pm ET / 10:35pm CT Network: ABC (Check local listings) NASHVILLE, Tenn. (October 31, 2016) – Chart-topping Country crooner Justin Moore will show off his comedic chops once again during a special appearance on Jimmy Kimmel Live! this Wednesday (11/2) at 11:35pm ET / 10:35pm CT on ABC (check local listings). Directly following the CMA Awards, the Platinum-selling singer will offer up a light-hearted new tune for the late night audience. Moore previously gave a hilarious reading of Drake’s “Hotline Bling” for KNIX-FM with his signature Southern drawl eliciting over 18 million views. Watch it here. As fans clamor to hear new music, Moore’s new single “Somebody Else Will” was recently introduced to Country radio and is already creating major buzz with Taste of Country saying “Expect this song to be his biggest hit since ‘Point at You.’” This is the follow-up to his sixth No. 1 “You Look Like I Need a Drink,” which recently ascended to the top of both the Mediabase and Billboard charts, as the lead single from his fourth album KINDA DON’T CARE. Moore will kick off his co-headlining AMERICAN MADE TOUR with Lee Brice at the beginning of 2017 with opening acts William Michael Morgan and Brett Young joining for the 25 dates already on the books. For tickets, tour dates and additional information visit JustinMooreMusic.com. JUSTIN MOORE SCORES THIRD #1 ALBUM DEBUT WITH KINDA DON’T CARE Smothers Charts with #4 Billboard Top 200 Debut and Top 5 Single with “You Look Like I Need A Drink”, Celebrates Release Week with Waffle House® NASHVILLE, Tenn. (August 22, 2016) – After a whirlwind release week filled with sold-out shows, once-in-a-lifetime fan experiences and late night adventures, JUSTIN MOORE has much to celebrate as his fourth studio album KINDA DON’T CARE (The Valory Music Co.) notches the #1 spot on the Billboard Country Albums chart. The project features his newly minted Top 5 single “You Look Like I Need A Drink” and also earned the singer his fourth Top 10 All Genre debut, landing at #4 on the Billboard Top 200 chart. The Poyen, AR native showed no signs of slowing down with a packed show in his home state before continuing to Nashville, TN, Charlotte, NC, Harrisonburg, VA and Indianapolis, IN for intimate performances of his new music as well as his most popular hits. The platinum-selling singer then celebrated post-show by cooking up some of his favorite dishes at Waffle House® locations in each market. During his last show of the week on the TAKE IT OUTSIDE TOUR in Indianapolis on Friday night, Moore was joined on-stage by label mate and good friend Brantley Gilbert for “More Middle Fingers,” which is just one of the 16 tracks on KINDA DON’T CARE. He also belted out #1 hits like “Point At You” and “Small Town USA” before heading to Waffle House® where Big Machine Label Group President/CEO Scott Borchetta greeted the singer with celebratory #1 Waffles to commemorate the successful week. Moore will continue the momentum this week on the TAKE IT OUTSIDE TOUR in Bonner Springs, KS (8/25) and Atlanta, GA (8/26). For tour dates and more visit, JustinMooreMusic.com. 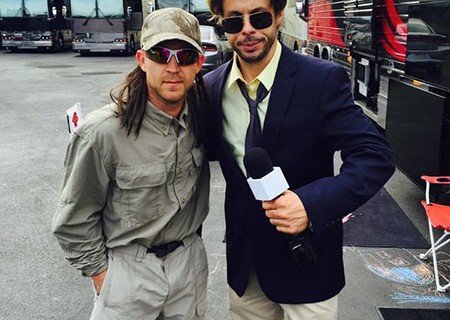 JUSTIN MOORE GOES UNDERCOVER TO MEET HIS BIGGEST FAN IN PREMIERE OF “THE ED BASSMASTER SHOW” ON CMT NASHVILLE, Tenn. (April 14, 2016) – YouTube star and prankster Ed Bassmaster helps country music’s Justin Moore go undercover to meet his biggest fan in the premiere episode of “The Ed Bassmaster Show,” airing Thursday, April 14 at 10pm ET/PT on CMT. It will re-air throughout the weekend. For a full list of airdates, visit cmt.com. Click to view the trailer. In the new show, comedian Ed Bassmaster debuts his unique and hilarious characters including Skippy, Mumbles The Waiter and Bushman. Jaws will drop when they see what Justin looks like disguised as someone on his tour who is slightly less famous, all in an effort to surprise one of his long-time fans with a personal meet and greet. [bctt tweet=”@JustinColeMoore goes undercover to surprise biggest fan on @EdBassmaster PREMIERE on @CMT Apr. 14 @ 10pm ET/PT!”] Full of laugh-out-loud moments, fans will get to see the funny side of Justin, platinum-selling, No. 1 hit-maker known for his current single “You Look Like I Need A Drink,” and former hits, “Small Town U.S.A.,” “Backwoods,” “Point At You,” “’Til My Last Day,” “Bait A Hook,” “I Could Kick Your A**,” and “If Heaven Wasn’t So Far Away.” Justin’s latest “You Look Like I Need A Drink” is swiftly climbing up the country charts, currently at the No. 25 position. If you haven’t seen the Wild West-themed music video for the song, check it out on cmt.com/videos. “This may be my favorite video I’ve ever shot. I am a huge Western fan, and we shot one with a dose of comedy,” he said. Tune in and be part of the conversation with #EdBassmasterShow and follow @JustinColeMoore on Twitter and Instagram. For more information on Justin Moore, visit justinmooremusic.com. About Justin Moore Arkansas native and 2014 ACM New Artist of the Year Justin Moore recently released his newest single, “You Look Like I Need a Drink” which is currently making its way up the Country radio charts. This follows his second consecutive #1 album release with OFF THE BEATEN PATH. The project produced Justin’s fourth and fifth GOLD-certified #1 hits, “Point At You” and “Lettin’ The Night Roll.” Combined with two previous GOLD–certified albums, he’s sold over 7 million digital downloads. The Valory Music Co. recording artist has been featured on The Voice, Nashville, NFL Rewind, The Washington Post, People Country, USA Today, Fox & Friends and more. He has earned multiple ACM, ACA and ACC Awards nominations. In 2015, Justin was direct support on Brad Paisley’s CRUSHIN’ IT WORLD TOUR. Justin will join Colt Ford on the road this summer for Brantley Gilbert’s TAKE IT OUTSIDE TOUR. For tour dates and more visit, JustinMooreMusic.com. Justin Moore’s New Official Music Video For “Til My Last Day.” “Til My Last Day” is the first love song that Justin Moore has ever released to radio. Although I love the kind of songs he usually releases, I have to say my vote goes for more love songs! He does them so well! A while back Moore released a Live video for “Til My Last Day” that included scenes of him on the road and him with his family. This week the official video came out, and let me tell you…IT IS AWESOME! It is so sweet and I can’t lie to y’all…I even teared up (yes it is that good). I don’t want to give anything away, so just do yourself a favor and watch it here now! Justin Moore Showed Up In Support Of The Newest Cabela’s Store. Justin Moore gave a free, acoustic show to the community of Rogers, Ar yesterday evening. This performance was to celebrate the grand opening of the newest Cabela’s store in his home state. The actual opening of Rogers’ Cabela’s was this morning, at 9am! Moore continuously said how great it was to have this addition to the community. “Thanks for bringing some jobs to this state with the economy that’s not doing so great.” -Moore to Cabela’s Moore gave the fans a great show singing “Hank It,” “Til My Last Day,” “Grandpa,” “Bait A Hook,” “If Heaven Wasn’t So Far Away,” “Small Town USA” and more! Justin Moore’s Official Music Video For “Til My Last Day.” Justin Moore’s latest single “Til My Last Day” is a sweet, honest, love-song. It comes from his album Outlaws Like Me and is the follow up to “Bait A Hook.” The video shows us what Moore is all about…his family and his music! We get a special look at the “Small Town USA” singer while he spends time with his wife and daughters, as well as a priceless look at his audience while he connects with them on stage! Watch “Til My Last Day” here now and tell us what you think!